My Little Patch of Sunshine: Kimberly Clark Room-A-Day Giveaway! 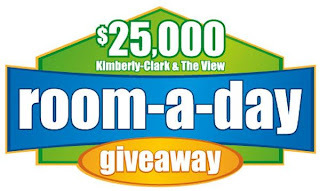 The folks over at Kimberly-Clark (who sell great brands like Huggies and Kleenex that we use in our house daily) are having a sweepstakes to give away $25,000 a DAY for 16 days to make over any room of your house! How awesome would that be to win? You can enter once a day, from now until March 7, 2008. One winner per day will be announced on The View from January 28 through February 15, with a final winner announced on their website on March 21. Once you register, it's very easy to go back and enter the drawing each day. We've been working with about a $150 budget to give each of the boys their own room. I have been daydreaming a bit thinking about what room I would spend $25,000 to renovate and think it would have to be my master bedroom -- unless I could put it towards our much-needed addition! Take a moment and enter right now! If you win, I can't wait to see pictures of what you do with all that money!